Join me and wear blue! And do the Big Blue Test! Nifty background and I love your photo of YOU! love the blue nail polish...i had to look closer to see if you didnt have blue eye shadow tucked away in there! You look great in any color - but love you in the blue too!! 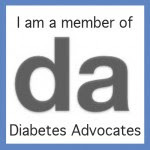 November = the only time when it is okay for people with diabetes to be "blue"